Grace holds a Bachelor of Arts degree in Urban Studies from Columbia University, where she studied from 1989-1993, and a Masters degree in Public Policy from Harvard’s Kennedy School of Government, which she attended from 1993-1995. According to her biography, after a 19 year career with the City of Sunnyvale (the last six as Finance Director), Grace was hired by the City of Irvine as their Administrative Services Director in January 2016. In October 2016, she was promoted to Assistant City Manager (working alongside longtime Assistant City Manager Sharon Landers). After Irvine City Manager Sean Joyce’s October 2017 announcement of his intention to retire, Grace filled in as Acting City Manager from December 2017 through the hiring of John Russo on July 10, 2018. Grace’s job status since then is unclear. According to the City of Irvine website, Mr. Russo hired Marianna Marysheva as Assistant City Manager on July 27. Ms. Marysheva was presumably intended to replace one of the existing assistant managers, but it also appears Grace continues to serve Irvine as Assistant City Manager through September 3. At a special closed session at the Newport Center Marriott on Monday, July 23, the City Council spent an entire day interviewing what we now know to have been 7 candidates for the City Manager position out of a total of 72 applications. Three unnamed finalists were given second interviews by telephone in a special closed session on Monday morning, July 30, starting at 9:00 a.m. in the City Council Chambers (see the Recent Events surrounding this on July 27 and July 28). A slightly ambiguous statement read in public at the end of the closed session, and later posted on the City’s website, suggests the Council may have selected a candidate to make a job offer to (“pursue”), but, pending the candidate’s acceptance of the offer, will not mention the person’s name or what the vote on making the selection was. An alternative (but less plausible?) reading of the same statement is that the Council is down to two finalists, and has yet to make a choice between them. The City has refused to clarify the statement, as it has also refused to release the names and resumes of the three finalists or even to provide the complete details of a vote partially reported in the statement. On July 30, the public was given an opportunity to comment before the Council went into closed session in its Conference Room — with about a dozen out of a crowd of 50 or so speaking, most responding to rumors that Orange County Supervisor Shawn Nelson was among the finalists. Supposedly no “appointment” was to be made at the July 30 meeting, but in past appointments, the Council did not announce its appointment until a contract had been worked out and agreed to, even though the Brown Act would seem to require an announcement of the selection at the meeting where it was made. Because contracts involving employee compensation can be discussed and approved only at regular meetings, the finalist interviews may have been moved up to July 30 from the previously-announced August 13 in order to allow completion of a contract, and its acceptance by the the new hire, prior to the Council’s next regular meeting on August 14. Project Overview: On Sunday afternoon, March 25, 2018, the City’s Public Information Manager reportedly sent a message to the media saying “After two decades with the City of Newport Beach and nearly a full decade as its city manager, Dave Kiff has informed members of the City Council that he will leave his post toward the end of 2018.” The parties since, by mutual consent, signed a contract terminating Mr. Kiff’s service by August 31, 2018, at the latest, and the Council hired an executive recruitment firm, Roberts Consulting Group, to search for a replacement. The secretive process concluded with the Council’s announcement, at its August 14, 2018, meeting, of Grace Leung as the new City Manager starting September 4, 2018. Why We’re Watching: Since under the form of government we have in Newport Beach the City Manager is completely responsible for the administration of the City and the face it presents to the public, the appointment of the manager is arguably one of the most consequential decisions an elected City Council makes. SPON is concerned that in the present instance the Newport Beach City Council is being over secretive about the process by which a new manager is being selected. While the presence of an online survey (see May 3 under “Recent Events,” below) was welcome, it is disturbing there was essentially no public discussion of how the recruitment firm was selected, and that no public discussion seems to be planned of what the Council will do with the survey results, or what the Council itself is looking for in the next City Manager. As best we can tell, the City does not even have a page on its website to track the recruitment process and keep the public informed about it. This page attempts, in part, to fill that void. With the new manager in place, no events are upcoming. Grace Leung reflected on her first 90 days in office in a talk to Speak Up Newport. The event can be viewed via the City’s streaming video site. Grace Leung will begin service as Newport Beach City Manager starting Tuesday, September 4, 2018. Assistant City Manager Carol Jacobs will serve as Acting City Manager over the Labor Day weekend. August 31, 2018: Last day of work for outgoing City Manager Dave Kiff. August 30, 2018: From 3:30-6:00 pm, the Newport Beach Chamber of Commerce hosted a retirement event on the “Civic Green” (the lawn at City Hall) for outgoing City Manager Dave Kiff. August 14, 2018: The City Council held its only regularly scheduled meeting in August, and the agenda (posted on August 9) contained several items related to the City Manager replacement, culminating in the appointment of Grace K. Leung as the City’s new manager and the approval of an employment agreement with her at essentially the same terms as those of outgoing City Manager Dave Kiff. Video is available of the Closed Session Report, a Statement by Mayor Duffield and Contract Item 23. Item IV.D to privately discuss the appointment of a new City Manager. The notice says “A new City Manager may be appointed at this meeting,” but goes on to say “It is not uncommon for an appointment to become effective at a future date, such as the date set forth in the open session item for the new City Manager’s employment agreement” — possibly intended to leave open the possibility the name of the person that is appointed will not be revealed until the effective date of September 4, 2018). The fact that a contract for employment effective September 4 is being presented for approval as Item 23 on the open session agenda appears to belie the notion that this item is actually be used to select an appointee. For a choice to still be possible, there would have to be two or more remaining possibilities, all of whom have given notice to their current employers (but not to the Newport Beach public) that they are prepared to start on September 4. Item IV.E announced a private “conference” between the Council and the Mayor acting as “labor negotiator” for the hiring of a city manager. It might be noted that the Brown Act Section 54957.6 supposedly justifying this “conference” is limited to instructing the negotiator. Since a completed contract is being presented for approval as open session Item 23 (see below), it appears no further negotiation is planned, making this closed session wholly unnecessary and improper — and is being held to circumvent the requirement that the “final action” on appropriate compensation for key employees be debated and decided in public. An announcement read by the City Attorney when the Council returned from closed session said they had selected Grace Leung as the new City Manager. Item 4 on the “Consent Calendar” proposed the adoption of a resolution establishing August 28, 2018, at 5:00 p.m. as a “regular” City Council meeting date. California law, in response to the City of Bell scandal, allows the approval of the contract specifying the salary for new manager to occur only at a regular meeting. It is possible approval of the employment contract with the new (unnamed) City Manager, presented as Item 23 on the August 14 agenda, may be deferred to the new August 28 meeting. The existence of this item appears to indicate an lack of familiarity with the Brown Act on the part of the City. Regular meetings are, by their nature, expected to occur on a regular, predictable schedule — not to be one-off events. The lack of predictable meeting times and places was largely what the Brown Act was originally enacted to cure. See Section 54954(a). When items announced on a regular meeting agenda cannot be completed in the allotted time, the Brown Act allows them to be continued to a later date announced at the meeting, with resulted regarded as an “adjourned regular meeting” (something Newport Beach held many of in the past). See Section 54955. Creating new and unpredictable “regular” meeting dates at which potentially any variety of new agenda items could be introduced to be treated as if they were held at a true regular meeting is not what the Brown Act was intended to allow. In view of the Council having selected Grace Leung in closed session, the City Clerk’s request for Item 4 was withdrawn and the special “regular” meeting was not scheduled. Item 23 presented for approval an employment contract, starting September 4, with an unnamed City Manager. It also approved Assistant City Manager Carol Jacobs acting as City Manager in the interval between the old City Manager’s last day on Friday, August 31, and the new Manager’s first day on Tuesday, September 4. The Council approved the employment contract with the name “Grace Leung” inserted into it. August 3, 2018: In an attempt to obtain clarity, resident Jim Mosher filed a new Public Records Act request for the names of the Council members participating in the 4-member vote reported in the Council’s July 30 closed session report. Since the City’s response, received the same day, and a follow-up to it, cited no exception to the Public Records Act allowing non-disclosure of a record in the City’s possession, but simply that no record could be found, the City appears to be claiming it has no record at all of the remainder of the vote reported, even a confidential one. The idea that the City keeps no records, even confidential ones, of the decisions made in closed session, and publicly reports information for which it has no records to rely on, is rather alarming. August 2, 2018: City staff refused July 31 requests from residents Lynn Swain and Lauri Preedge for the full Council vote on the promotion of applicants to finalists (in its July 30 closed session report, the Council said that Council member Jeff Herdman had been one of four members voting to advance a candidate Herdman later felt was unqualified). The City’s response to Ms. Swain is here. The response was ambiguous but suggested the City had no record it could find of who the three Council members joining Herdman in that vote were. A “Privilege for Official Information” is invoked from California Evidence Code Section 1040, a body of law regarding what one can refuse to testify about in court proceedings — something that seems irrelevant here, although in the end it seems to devolve to the same standard for non-disclosure as the “deliberative process” exemption cited next. Next, to invoke what it calls the “Deliberative Process Privilege” of Government Code Section 6255(a), the City seems to think it sufficient to quote the law’s text (namely, that when all else fails, an exemption can be claimed when based “on the facts of the particular case the public interest served by not disclosing the record clearly outweighs the public interest served by disclosure of the record“) without actually explaining what facts make such a conclusion “clear” in this case. There seems a certain arrogance (or laziness?) on the part of the City in claiming they qualify for this exemption without deigning to tell the public why it qualifies for it. Presumably the City’s claim is that disclosing the names of the applicants could be jeopardize their current positions and hence discourage good people from applying. However, these are public officials voluntarily operating in the public sphere which should give them a lessened expectation of privacy with respect to those actions. It is is very much in the interest of the public in Newport Beach to know details about the applicants so they can guide and inform their elected representatives in their choice. It is likewise very much in the interest of the public in those individuals’ present cities to know their public servants are applying for jobs in Newport Beach. If hired, it will likely cause disruptions their, so those citizens may wish to take action to encourage them to stay or to correct the situation making them want to leave. At least they would want to know a change could be coming so they could prepare for it. As a result of these considerations, it would seem the promises of confidentiality were made more to protect the private interests of the applicants than the interests of the public, and hence, contrary to the City’s conclusion, the balancing test of Section 6255(a) should tip in favor of disclosure rather than non-disclosure. The City then claims the records additionally can’t be disclosed because of the “personal contact information” they contain, disclosure of which would constitute an “unwarranted invasion of the privacy” — even though any home addresses, telephone numbers or emails they might contain could easily be redacted. In making this claim, the City cites no specific code section, but instead gives a list of five California appeals court cases, two of which Proposition 59 in 2004 was promised to reverse, and most of which actually reject alleged invasions of privacy being sufficient to offset the public’s interest in disclosure. Finally, the City invokes what it calls the “Closed Session Communications” exemption of Government Code Section 6254.25, something that by its own language protects attorney work product until the pending litigation it is related to has been finally adjudicated or otherwise settled — and something (like the first claimed exemption) that has no obvious relevance to the names and resumes of city manager candidates. August 1, 2018: Council member Herdman, who had been condemned in the Council’s July 30 closed session report for leaking names and voting for a candidate he later found unqualified, sent out an email denying he had leaked any names, but verifying he voted to advance to the finals a person who he later realized was unqualified. Per an announcement made at its July 24, 2018, meeting (see entry, below), the City Council was expected to meet in closed session on August 13 — at an hour and location to be announced — for follow-up interviews with the three finalists it has chosen for the City Manager replacement. However, on July 27 (see entry, below) the City posted a new announcement (see entry, below) saying the interviews would take place on Monday, July 30, instead, at 9:00 a.m. in the City Council Chambers Conference Room. Although the City chose not to produce a video of this meeting, it did preserve an audio recording of the public portion, as well as copies of the many written comments submitted by members of the public. After about 30 minutes of public comment in the Council Chambers (with approximately 50 people in attendance), the Council retired to the private Conference Room for roughly two hours of closed session. Three candidates were apparently interviewed by phone. A possible reason for moving the interviews up was to allow the contract negotiations with their final choice (if a choice could be made on July 30) to begin in time for a completed contract to be ready for approval at the Council’s August 14 regular meeting (contracts affecting compensation can be discussed and approved only at regular meetings, the next of which after August 14 — because the Council takes the last half of August off — would be September 11). Regarding the contract, the Council had previously designated Mayor Duffield as its negotiator at the special meeting on July 23. The Council may have given the Mayor instructions as to allowable salary and benefits during a noticed closed session with its “negotiator” on July 24. If a final selection is made on July 30, it is required to be announced at the meeting, where it is made, but the agenda assured the public no “appointment” would be made on July 30. That assurance might well have constituted a playing with words, for the City Attorney may be using a theory that even if a “selection” is made, the person isn’t an employee and an “appointment” hasn’t been made until a contract has been signed. Twisting the words to allow a decision made in closed session to be hidden should not be tolerated, since the California Constitution (Article I, Sec. 3(b)) requires the words of the Brown Act to be broadly construed when such construction favors openness, and narrowly construed when the proposed reading allows or promotes secrecy. Indeed, since executive employment contracts have to be approved in open session, the closed session appointment reporting requirement would be meaningless if appointments can’t be made in closed session. At the end of the July 30 closed session, the City Attorney read a slightly ambiguous closed session report (later posted as a “News Splash” on the City website) saying the candidate who had been “the subject of community speculation” had been eliminated from consideration (many took this to be a reference to Orange County Supervisor Shawn Nelson) . The statement went on to suggest the Council may have selected a candidate from among the remaining two to make a job offer to (that is, to “pursue”), but, pending the candidate’s acceptance of the offer, will not mention the person’s name or what the vote on making the selection was. An alternative reading of the same statement is that the Council is down to two finalists, and has yet to make a choice between them. A request for clarification has not been answered. Former Mayor Keith Curry sent out a mass email supporting (and repeating) the July 27 rumor that Supervisor Nelson was a finalist for the City Manager position, and urging the public to send comments to the City Council. Council member Jeff Herdman sent an email to constituents expressing concern about the change in plan announced on July 27, and seeking input on his additional concern that in his opinion two of the three (unnamed) finalists to be interviewed were well qualified while the third, who he feared might be favored by a majority of Council, was not. Activist Susan Skinner posted an online petition protesting the rumored appointment of Supervisor Nelson and facilitating comments to the Council. July 27, 2018: Late Friday afternoon, the City Clerk caught many by surprise by posting a special meeting agenda on the City website saying the interviews with the three City Manager finalists, previously planned for August 13, would be held, instead, on Monday morning, July 30, starting at 9:00 a.m. with the meeting beginning in public in the City Council Chambers and then adjourning to the Council’s private Conference Room for the closed session interviews. 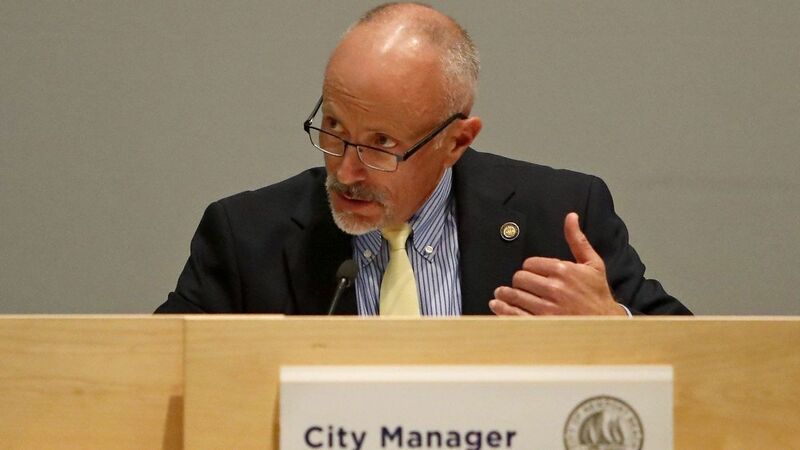 Rumors immediately began circulating that soon-to-be-termed-out Orange County Supervisor Shawn Nelson was one of the candidates being considered for the City Manager position, and that the special meeting was being held to facilitate his appointment. Many in the public expressed concern that Mr. Nelson appeared to be a career politician with no experience as a city manager or administrator of a comparable organization. While the Newport Beach City Manager position would represent a roughly $100,000 increase in salary (with attendant pension benefits) over the position of County Supervisor, if Mr. Nelson were indeed a candidate, and if he accepted the Newport Beach City Manager job, the principle of incompatible offices (California Government Code Section 1099) would almost certainly cause him to automatically forfeit his office on the Board of Supervisors, leaving the residents of the north County district who elected him without representation until a successor could be appointed or elected. July 24, 2018: As Items IV.B and IV.C on its closed session agenda, the City Council discussed the appointment of a new City Manager and salary negotiations, similar to the notices for the July 23 special meeting, but with the additional statement that no appointment would be made on July 24. Based on this, it appears that in the July 24 closed session the Council selected the three finalists (who remain unnamed), and may have given Mayor Duffield directions to negotiate with them, or a future selection, over contract terms. Council conducts interviews and picks a favorite. Recruiter does background checks while Mayor negotiates possible contract which may or may not be accepted by candidate. Appointment formally made only if previous step successfully completed. Selected person gives notice to current employer. New manager appears only after being released by current employer. July 23, 2018: The City Council held a Special Meeting starting at 8:00 a.m. at the Newport Beach Marriott Hotel and Spa (agenda here). The agenda included an opportunity for the public to speak to the Council, in the lobby before they adjourned to the closed session, which apparently took place in a room upstairs. What appeared to be the main part of the agenda, to be conducted pursuant to Government Code Section 54957(b)(1), allows for discussion about candidates and interviews of candidates, mindful that Section 54957(b)(4) prohibits any discussion, under this title and exception, about compensation (including salary and benefits). Under this heading, it was later revealed (in the closed session report on July 24) the Council members interviewed seven city manager candidates. This likely included pre-interview preparation and post-interview debriefing by the contact recruiter per the terms of contract C-8550-1. The agenda also said that after publicly appointing him as their negotiator, the Council would, pursuant to Government Code Section 54957.6(a), privately instruct Mayor Duffield regarding negotiations over such contract matters as compensation for the new Manager. The minutes of the July 23 special meeting are not yet available, but it seems likely that at the end of the closed session interviews (which reportedly lasted most of the day), the public announcement was that “no reportable action” had taken place. Limited details of what took place on July 23 were, however, reported at the July 24 Council meeting (see above). July 12, 2018: Outgoing City Manager Dave Kiff shared his experiences as city manager and offered his advice for the future at the Newport Beach Chamber of Commerce’s Wake Up! Newport event held in the Friends Room at the Central Library. Details here. July 10, 2018: Item IV.D on the City Council’s closed session agenda provided the same notice as that posted on June 26. Based on the contract signed on April 27, the recruiter was expected to present the City with an interim report on the candidates during Week 10 of the contract (the week starting July 9?) and help the Council begin interviews in Week 13 (the week starting July 30?). Since what appeared to be the recruiters were seen leaving the Council Chambers after the closed session, it seems likely they delivered their “interim report” to the Council on July 10. However, there was no public disclosure of what may, or may not, have happened. Since the cited California Government Code section says only “this chapter [the Brown Act] shall not be construed to prevent the legislative body of a local agency from holding closed sessions during a regular or special meeting to consider the appointment, employment, evaluation of performance, discipline, or dismissal of a public employee,” the explanation is not particularly informative. Most authorities seem to believe the sole reason the Brown Act allows the closed sessions is to protect the privacy of candidates during interviews, and hence that the closed sessions are not intended for general discussion of the recruitment process, including the general qualities being sought in a new city manager. In the oral announcement that precedes closed sessions, the City Attorney said the Council would not be discussing this item, so presumably this closed session did not occur. June 25, 2018: Per the job description brochure published by the City’s contract recruiter, Roberts Consulting Group, (of which there seems to have been an original and a revised PDF) this was the last day for interested candidates to email applications to them. The recruiter has promised to screen the applications and present the “most qualified” ones to the City Council. May 30, 2018: Newport Beach City Manager job posting appeared on ICMA and Western City websites, both linking to the brochure on the Roberts Consulting site. May 24, 2018: Notice of job opening for City Manager appears under “Job Opportunities” on City’s Human Resources Department page. Interested parties are directed to a brochure on the Roberts Consulting Group website. It indicates applications must be received by June 25. The brochure (the origin of the content of which is unknown) echoes the City Manager job description on the City’s Human Resources website plus powers and duties from Section 504 of the City Charter. The authors were apparently unaware that as Item 17 at the City Council’s May 26, 2009, meeting (as part of the previous recruitment) a revised job description and revised qualifications had been adopted — but, for unknown reasons, never uploaded to the HR website, despite the HR Director at the time having participated in crafting the language. As a result, the current crop of applicants has been given misinformation regarding the job description and qualifications. May 22, 2018: As later revealed in response to a Public Records Act Request, the City Clerk on this day gave her emailed approval to the recruitment brochure prepared by Roberts Consulting Group. The initial response had been that the City had no disclosable records related to its interactions with the recruiter. The emailed approval was disclosed later, and only after the public asserted that City approval of the brochure was one of the deal points in the public contract, and as such the public had a right to know that the approval had been given, and by whom. It remains disturbing that the City appears to have no record of City Council participation in this decision, especially since the understanding from April 10 was that the City Clerk would be acting only as an agent for the Council. May 18, 2018: Online survey (see May 3, below) closed at end of day. The City did not immediately seem to post any of the results, but a May 23 article in the Daily Pilot summarized them, apparently based on information disclosed in response to a Public Records Act request by the Daily Pilot. What appears to be a complete set of results later appeared, without announcement, under “Open and Transparent” on the City website. May 15, 2018: Copy of contract C8550-1 with Roberts Consulting Group apparently uploaded to City’s contract archive, but not to the “Contracts and Agreements Approved within the Last 30 Days” page. A Public Records Act request to inspect the document remained unanswered until May 24. The contract calls for the consultant to visit the City three times. The first is to obtain approval of the recruitment brochure, and may have occurred during the closed session on May 8 (before the citizen’s survey had closed). The second is discuss the preliminary screening of the applications, and the last to assist with the interviews of finalists. Much of the selection and screening will apparently be done by the consultant in apparent contradiction of Newport Beach City Charter Section 500 which requires the City Council to screen all qualified candidates. May 8, 2018: In a poorly advertised afternoon study session item, the Council agenda announced an opportunity for the public to speak to them about the qualities wanted in a new City Manager. Only one member of the public spoke. The Council then met in closed session to discuss “PUBLIC EMPLOYEE APPOINTMENT (Government Code Section 54957(b)(1)): 1 matter, Title: City Manager.” This announcement led to considerable speculation the Council might actually be considering the appointment of a permanent or interim City Manager that night. The speculation was exacerbated by the City Clerk and City Attorney’s refusal to discuss their understanding of the scope of the discussion allowed under the announcement, and if the discussion would involve actual candidates for appointment. No report of actions taken in the closed session, which might possibly have involved general discussions of questionable legality with the City Clerk or recruitment consultants, was provided. In the regular, open session, the Council, without admitting any fault, responded to the April 10 “cure or correct” letter by asserting, in Item 10, that the public actions to amend the City Manager’s contract on April 10 had corrected any procedural errors that may have occurred preceding that. May 3, 2018: City posted a News Splash on its home page announcing the availability, through May 18, of an online survey through which “The Council is seeking input from community members as to what qualities and traits the next City Manager should possess.” It actually asks mainly about the priority of the issues facing the City, and to a much lesser extent about the attributes community members would like to see in the next City Manager, with “Additional Thoughts” limited to 250 characters (and 50 characters for “other priorities”/”other attributes”). It is unclear who prepared and posted the survey or exactly what will be done with the results. April 27, 2018: Contract C8550-1 with Roberts Consulting Group signed by the City Clerk, alone, and not by the Mayor as the Council had directed on April 24. The contract was not immediately available for public inspection. April 24, 2018: The agenda announced an early afternoon closed session to discuss “PUBLIC EMPLOYEE APPOINTMENT (Government Code Section 54957(b)(1)): 1 matter, Title: Initiation of Recruitment Process for New City Manager.” After being warned that this Brown Act (the California open meetings law) exception allows only the discussion of specific, individual candidates, and not the recruitment process in general, the City Clerk withdrew the item. On the regular evening agenda, as Item 11, the Clerk provided the Council with letters from three executive recruitment firms offering to assist with the process. Without publicly interviewing any of them, the Council authorized the Mayor and Clerk to contract with Roberts Consulting Group Inc. The actual contract has not been posted as of May 8. Although not clearly mentioned at the meeting, the City’s Human Resources Director had on April 4 signed an open-ended $75,000 contract (C-7398-1), effective April 16, with one of the other firms, William Avery & Associates, for on-call executive recruitments. April 10, 2018: The Council met in closed session to review the job performance of the City Manager and to instruct Mayor Duffield regarding labor negotiations with him. In the open, regular session, as Item 12, the Council approved an amended labor contract that had evidently been previously negotiated and signed by the City Manager. The contract called for him to leave by August 31 at the latest, and earlier if an Interim City Manager is appointed. It also called for certain exceptional payments to be made to the outgoing City Manager if the terms of the agreement are followed, including a non-disparagement clause under which neither side can speak ill of the other (see signed contract C-7033-3). The Council also put the City Clerk in charge of the mechanics of the recruitment process for the new manager. Meanwhile, in public comments, the Council received a Brown Act “cure or correct” letter, demanding the night’s actions be set aside, charging they were predetermined by a majority of the Council reaching decisions outside noticed public meetings (something prohibited by the Act). March 28, 2018: The City posted on its website a “News Splash” (since deleted) assuring the public the City and its Manager had decided to amicably part ways. March 27, 2018: Although not formally on the City Council agenda, the City Manager asked for an item regarding amendments to his contract to be put on the next agenda. Despite the standing item for public comments on non-agenda items being moved to the end of meeting, many people stayed to make comments on this item (see video). September 12, 2009: Dave Kiff begins work as City Manager. The time from announcement of a pending retirement to the start of the new Manager was approximately four months. August 18, 2009: Council holds special meeting (see agenda) After 11 minutes in closed session, Mayor Selich (at 1:50 in video) announces the Council has selected Dave Kiff (despite City Attorney David R. Hunt having announced “no reportable action” took place in closed session – see 1:22 in video). After another 6 minutes, or so, of speeches and applause, the five Council members present voted to appoint Kiff and approve his employment contract, confirming those actions by adoption of Resolution No. 2009-61. Since the selection appears to have been a carefully guarded secret, its appears that neither the resolution nor the contract (both of which contained Mr. Kiff’s name) were available for public inspection prior to the vote to approve them. Near the start of his remarks (at 9:00 in the video), Mr. Kiff mentions how hard it was “keeping the secret.” After he concludes Mayor Selich (at 12:20) says: “I was the one that had the pleasure of telling Dave he’d been selected, and I saw that grin on his face and I wondered how he was going to keep his composure because we told him he had to keep it quiet till we did a few things for [pause] took a little longer than we wanted, but you did a good job, Dave.” From all this, its seems clear the decision to appoint had been made at an earlier date (the August 11, 2009, closed session?) and the closed session on August 18 was to discuss the contract terms, rather than the selection. August 11, 2009: Closed session includes item on possible City Manager (and City Attorney) appointment or evaluation. No action reported. July 28, 2009: Closed session includes item on possible City Manager (City Attorney and City Clerk) appointment or evaluation. No action reported. June 9, 2009: Closed session includes item on possible City Manager appointment or evaluation. No action was reported on that, although it was revealed the Council had voted to accept the resignation of the Police Chief (an item not clearly noticed, and probably not a Council decision, at that). May 26, 2009: As Item 17, the City Council approves a revised job description and revised qualifications for the City Manager position. For unknown reasons, the City Manager job description on the City’s Human Resources Department website was never updated, and continues to display the now 20+ year old earlier version — which was shown to candidates in the current recruitment. May 12, 2009: Item 12 on the Council agenda (pulled from the consent calendar) sets up a three-member City Manager Ad Hoc Recruitment Committee to guide a recruitment process. The staff report says Homer Bludau had recently announced he wanted to retire in early September, after 10 years with the City. Supplemental Item S20 approves a contract with outside recruiter Teri Black and Company, based on the recommendation of the Committee (which did not, technically, exist prior to the this meeting, but which, nonetheless reviewed the applications of firms interested in a recent City Attorney recruitment). April 28, 2009: City Council holds additional closed session to evaluate performance of City Manager Homer Bludau. No action is reported. April 14, 2009: City Council holds closed session to evaluate performance of City Manager Homer Bludau. No action is reported. May 10, 1999: First Council meeting at which Homer Bludau is listed as the City Manager. The time from the announcement of a retirement to appointment was about 6 months, and to the start of the new employee, about 8 months. March 8, 1999: Council holds a special closed session in The Grill Room at the Big Canyon Country Club from 11:30 a.m. to 1:30 p.m. No action is reported. The Council held an additional closed session in the Council Chambers between the study session and regular meeting, for which the agenda does not appear to have been preserved. Again, no action was reported. But as supplemental Item S27 at the regular evening meeting (for which a report was promised to be distributed at the meeting, but if it was, does not seem to have been preserved), Homer Bludau is announced as the City Manager appointee, to start work on May 3, 1999. February 23, 1999: Council holds a closed session regarding City Manager appointment. January 30, 1999: Shannon Associates makes an interesting presentation about Council-Manager government at the Council’s annual planning session. January 15, 1999: Council holds a closed session regarding City Manager appointment. November 30, 1998: Councilman Hedges makes interesting remarks on leaving office. October 12, 1998: Shannon Associates is selected as the recruitment consultant. September 14, 1998: An Ad Hoc Committee is appointed to review the RFP for outside recruiters, and to make a recommendation of the firm to select. August 24, 1998: Finance Director Dennis Danner is appointed Interim City Manager in a closed session. August 10, 1998: Last City Council meeting at which Kevin Murphy is listed as City Manager. Through a City Charter, adopted in June 1954 (effective January 1955), the voters of Newport Beach permanently selected a Council-Manager form of government (see Articles III, IV an V) — ratifying a choice that had been made voluntarily by its “general law” City Council in 1948 (see Ordinance No. 575). Under the Council-Manager form of government, an elected council, acting collectively in open, public meetings, establishes the administrative structure of the city and the policies and legislation governing it, but (with the exception of the activities of the council’s direct charter appointees — in our case the City Clerk and City Attorney) the day-to-day operation of the administrative apparatus (including hiring and firing employees and all city dealings with the public) is left entirely to an appointed professional city manager. In fact, our Charter Section 406 is a fairly standard non-interference clause prohibiting individual council members from attempting to influence administrative actions, and even the whole city council from providing direction to the administrative staff other than through the city manager. The above makes the selection of the City Manager one of the most important decisions a city makes. Although Charter Section 500 delegates the appointment authority to the City Council, public involvement seems crucial for a good result. With or without public involvement, Section 500 also places on the Council a positive duty to “screen all qualified applicants,” which may or may not be consistent with their use of a outside to recruiter to reduce their work. The current City Manager, Dave Kiff, was promoted and appointed to that position at a special closed session meeting of the City Council on August 18, 2009, and apparently started work as City Manager on September 12, 2009. He had previously served as one of the prior Manager’s two Deputies. As Item 16 at its April 25, 2017, meeting, the City Council approved synchronized “evergreen” contracts with all three of the employees it appoints (the City Manager, City Clerk and City Attorney). Each contract has an initial “term” of two years, but automatically renews for another year on that and the subsequent anniversary dates unless the City gives the employee at least six months notice of its intent to not renew. The employees can also voluntarily end these contracts by giving at least 45 calendar days notice of their intent to resign on any date. In neither case would any special benefits accrue at the end of the contract. Despite having mutually agreed to this evergreen arrangement in 2017, Mr. Kiff is said to have privately let the Council know he would not likely continue beyond the initial, April 25, 2019, anniversary of the contract. Nonetheless, the March 25, 2018, announcement that Mr. Kiff wanted to leave before the end of 2018 came as a great surprise to many in the community, especially since it had not been preceded by any noticed discussion of his employment with the Council (something the Brown Act allows to take place behind closed doors — see Privacy Concerns, below). The April 10 approval (see “Recent Events,” below) of a new employment contract ending August 31 and providing numerous termination benefits, not required by a voluntary termination under the 2017 contract, further fueled speculation that Mr. Kiff had either been encouraged to leave or made to feel very uncomfortable continuing in his position. Opinions are divided on the extent to which the city manager appointment process should be kept secret from the public. California’s open meetings law, the Brown Act, allows (but does not require) Council discussion of individual employees within the Council’s appointment authority (including candidates) to be held behind closed doors. It is not believed to allow closed session discussion of the recruitment process or the generalized qualifications the Council is looking for in a new appointee. Many executive recruiters claim revealing the names of applicants deters quality people from applying out of fear their interest in the job will be made known to their current employer (see this 2017 article regarding the San Bernardino City Manager). Nonetheless a number of California cities, and ones in other states, make the list of finalists known, and may actually require them to interact with the local public at noticed meetings. Others discuss the applicants publicly, but avoid the privacy issue by speaking of them without identifying information (referring to them, for example, as “Applicant 1”). Six to eight states (Florida, Colorado, Minnesota, Michigan, Louisiana, North Dakota and possibly Alabama and Utah) appear to require interviews of prospective employees by the council to be conducted in public (some may allow individual council members to interview candidates privately, but they can discuss their conclusions from those private interviews only in public). Florida appears to have the strongest of the state open meeting laws, requiring all meetings other than those related to pending litigation in which an agency is involved to be open to the public, and even the latter have to be recorded by a court reporter with the transcript released to the public immediately following settlement (unlike in California where most of the content of closed sessions is never publicly known, and it is even a crime for participants to disclose it). California’s Brown Act requires public discussion of personnel matters, including appointments, only when it involves elected positions or outside contractors. While California law does not require as much openness as Florida, it does not prohibit it, and explicitly allows agencies to adopt local rules requiring any level of transparency (Sec. 54953.7). Nonetheless, Newport Beach, without public discussion, appears to have opted for complete secrecy — asking for public input, but with no announced plan to publicly discuss what will be done with the results, and with no commitment to reveal the names or qualifications of persons being considered for appointment. It has to be noted that including in the search “quality people” who do not want their interest in the Newport Beach job to be known, runs the risk that the person hired will spend their time here quietly (and unknown to us) looking for a job elsewhere. This post on the First Amendment Coalition suggests that even in California it can be argued the public should be able to know at least the names of the applicant’s for the City Manager position. It cites the ballot arguments in favor of Proposition 59 in 2004. That California Constitutional amendment, which passed overwhelmingly (83.4% yes to 16.6% no), was, according to the arguments intended to reverse the reasoning in two court cases that had denied public access to the names of candidates for gubernatorial appointments (in one case, to fill a vacancy on the Orange County Board of Supervisors): Wilson v. Superior Court, 51 Cal. App. 4th 1136 (1997) and California First Amendment Coalition v. Superior Court, 67 Cal. App. 4th 159 (1998). Fourteen years later, and despite the endorsement of the proposition by 83.4% of voters, that information seems as difficult to obtain as it was in 2004. This entry was posted in Watch List and tagged City Manager, recruitment on May 12, 2017 by Jim Mosher.